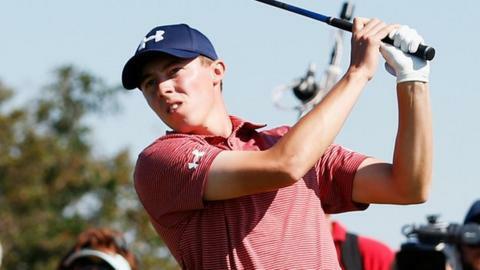 England's Matt Fitzpatrick came agonisingly close to recording the first ever 59 on the European Tour on Friday as he moved into contention in the KLM Open. The 21-year-old former US Amateur champion from Sheffield needed to birdie the ninth, his final hole, to break the 60 barrier. But his 20ft putt came up a few inches short and to the right of the hole. He lies three shots behind leader Soren Kjeldsen of Denmark. Even if Fitzpatrick's putt had gone in, his score would not have officially counted for record purposes because of the preferred lies in operation because of "rabbit damage" on the course in Zandvoort. The round of 60, which included 10 birdies and no bogeys, came a day after Paul Lawrie and Wade Ormsby shot 61 to share the first-round lead. Starting on the back nine, Fitzpatrick carded five birdies in a row from the 11th and picked up another shot on the 17th to reach the turn in 28, before further gains on the second, fifth, sixth and seventh left him needing to birdie one of the last two holes. "I was thinking about the 59 after the front nine to be honest," said Fitzpatrick, who has had three top-three finishes in his last eight events. "I was already celebrating going out in 28 actually so to give myself a shot at that magic number was great. "Shame that putt at the end came up short but I'll take 60 any day of the week."